1 What do we feed them? What do we feed them? Feed with good amounts of fish flake, cooked rice, damp bread crumbs or damp biscuit crumbs. Basically anything that comes to hand that can absorb moisture and has a reasonable level of protein and other nutrients. The quality of the nutrients in the food you feed these worms will ultimately be in turn fed to the animals in your aquarium. Some foods tend to smell more than other. Try feeding rice flour or plain white flour made of rice, potato, tapioca, maize and buckwheat (protein 17%) (basically an off-the-shelf gluten free flour available from most supermarkets) as this doesn't smell bad and seems to ensure a huge population boost for the tiny worms when they hatch. Probably due to the tiny size of the food particles. Sprinkle the flour over the soil and then make sure you spray the flour layer with water so it is wet through. Keep the worms cool (ideally between 10-21°C (50-69.8°F) , optimal is 15-21°C (59-69.8°F) . Above 29°C (84.2°F) they stop reproducing and die off . Soil ideally needs to be around a pH of 7 and slightly damp to the touch. Mix in a little Lime if it is too acidic. As the population increases and they excrete waste, the soil gets more acidic and ammonia forms, so regularly change a portion of the soil or add ammonia absorbing chips like zeolite. If not the culture will crash and kill all the worms very quickly (often in a few hours and they'll turn to mush and stink very badly. Early warning signs to look out for are the worms climbing the sides of their container. Ensure the container has air holes, they need oxygen to breath. But do not create large holes as termites and other small insects will smell the food and infect your culture. We suggest cutting a square hole in the lid and and gluing in place a square of fine nylon sheet over it as from a piece of window curtain. A black container is preferable (or keep it in the dark) as the worms will try to hide from any light and therefore may be driven away from the food if it is on the surface. White worms are hermaphroditic. The worms exchange sperm cells during copulation with one another, and eggs are laid in transparent cocoons. Cocoons produced by young adults contained 9-10 eggs each, while cocoons produced mature adults contained 20–35 eggs each, and those produced by old worms contained 2–3 eggs each. The average for the total population in culture was found to be 10 eggs per cocoon. 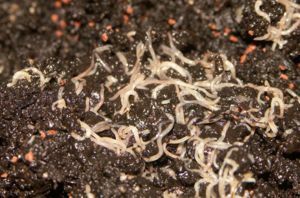 White worm eggs hatch in 12 days, and worms begin reproducing in 20 days. Each individual can produce as many as 1000 eggs over its life span (Ivleva, 1969). Expect 10 worms to turn into ~100 within 30 days . If not, check pH of soil, temperature, moisture of soil and check food is always present. Too high or too low moisture will reduce reproduction. Read links below for more detail. As the culture grows you'll notice tiny micro worms increasing in volume on the lid or sides of the container. You'll find that over the weeks that you'll need to add more food as the population increases and it is important to keep the worms well fed if you wish the culture to grow. Due to the fact that the culture can crash very quickly after a month or so, it is advisable to always have at least two containers of them at any one time. Once a month or two, take a sample of the oldest culture and place it in a new container with new soil. This will be your backup. Culture crashing is believed to be caused by the waste toxin of ammonia in the soil given off by the worms. So try added small lumps of zeolite to the soil or add 10ml of a ammonia neutraliser liquid like Prime, Stress-Lock or Ammo-Lock to 500ml of water, which you use to top up the moisture content of the soil. This will delay the crash. AQUARIUMWIKI TIP: Feed the worms flour made from only Rice flour. This type of gluten-free flour is high in protein and makes a culture far less smelly. A light sprinkling of flour every two days followed by a light coating of water with an ammonia neutraliser added will ensure your culture lasts for many many months. Occasionally turn over the soil to loosen it up. It is common to find other creatures (spider mites, fleas, etc.) living in the soil after a few weeks if you've used non-sterile soil. Tip: Garden shops do sell soil that is free of these pests. But keep the bag sealed after you open it! Often after a few months you'll find that these unwanted creatures have multiplied greatly. You can't use chemicals to kill them as that will kill the white worms. The only thing you can do is to carefully remove some worms and rinsing them in water, place them into fresh damp soil and start a new culture. Of course you can try to feed these tiny creatures to your fish. But it's not for the faint-hearted. This species is widely available from various sources throughout most countries. eBay and Aquabid constantly have auctions of these. Look for 'white worm culture'. ↑ 1.0 1.1 White Worm Devrim Memi - The Effect of Different Diets on the White Worm. White Worm Devrim Memi - The Effect of Different Diets on the White Worm.